I reckon cases that span jurisdictions are interesting. The law is confronted with them more and more often as technology and transport cuts across borders with greater ease. Common law courts struggled with such cases. The basic premise under the common law was "all crime is local" and jurisdiction over a crime lay with the country where the crime was committed: Macleod v Attorney-General (NSW)  AC 455 at 458. But what happened when the acts comprising a crime occurred in one country, but the criminal intention took place in another? At various times courts used a terminatory or initiatory theory of jurisdiction, deciding that crimes occurred where an offence finished or started. In Board of Trade v Owen  AC 602 the House of Lords concluded that a conspiracy formed in England to commit a crime in Germany was not a crime in England. But in Treacy v DPP  AC 537 the Lords decided that a man who sent a blackmail demand by letter posted in England to Germany committed the offence in the UK. 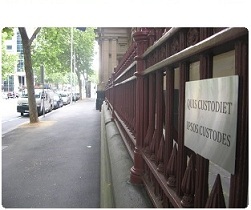 In Thompson v The Queen  169 CLR 1, the High Court considered a murder that happened near the ACT-NSW border. It said if the question of locality was in dispute, it must be proved on the balance of probabilities. Earlier in Ward v The Queen (1980) 142 CLR 308, the High Court considered if a murder on the Murray occurred in Victoria or New South Wales. The deadly shot was fired in Victoria (from the top of the riverbank); the victim was at the water's edge on the Victorian side of the river. The High Court later moved to a more pragmatic view in Lipohar v The Queen (1999) 200 CLR 485. That case dealt with a cross-border conspiracy focusing on a property in Melbourne, with the conspirators in South Australia, Queensland and Malaysia! A practical issue for investigators in all of these examples is to understand which law to apply. It's not an issue that courts have dealt with very often, and so there's been little curial guidance for investigators. Last week the Supreme Court held in Wallce v Debs  VSC 355 that an investigation in Victoria by non-Victorian police for offences that occurred outside Victoria (and would presumably be prosecuted outside Victoria) did not fall within the scope of Victorian investigation law. That particular case concerned Crimes Act 1958 s 464B (questioning a person for a different offence to the one they're held in custody for). But I imagine the same reasoning would apply for the other provisions of Part 3, Div 1, sub-div 30A. Put simply, if Victorian police go to, say, Queensland to interview a person and want to present that evidence in a Victorian court, they need to comply with Victorian investigation law. If Queensland police come to Victoria to interview a person and want to present that evidence in a Queensland court, they need to comply with Queensland investigation law. But they will also need to observe local substantive legislative requirements about gaining access to suspects (such as arrest and time in custody, or access when already in custody) and so require the assistance of local colleagues. An extreme example might be R v Thomas (2006) 14 VR 475, where Jack Thomas was interrogated in Pakistan by Australian Federal Police members purportedly in accordance with Australian domestic law. That appeal was on different issues — mainly voluntariness of admissions — but seemed to accept an interview to be used in an Australian court would be conducted in accordance with Australian laws, though it took place in Pakistan. The Standing Committee of Attorneys-General is continuing its focus on cross-border investigations (started back in 2003 and appearing in Victorian law in the Crimes (Assumed Identities) Act 2004 and Crimes (Controlled Operations) Act 2004). So we might yet see more legislation on this topic in the future. In Lipohar v The Queen (1999) 200 CLR 485, in particular "so long as there was a real connection between the State and offence"
Should this to be read as similar to the 'real & substantial link' provisions in S.80A of the Crimes Act? Excuse my ignorance but is this meant to be applied only to Common Law offences? Apart from where there is specific legislation that deals with Extra territorial provisions, such as S.80A Crimes Act, say for example an extortion (S.27 & 28 Crimes Act) where there are no such legislative provisions. The offender is in NSW where he bases his 'demand' from, the effects of which will be felt by the intended victim in Vic. I was always of the belief that the 'Terminatory Theory' would be the one relied on or do you say that it is possible that the courts may take a similar approach as in Lipohar? Cross border incidents are not uncommon for crimes such as Blackmail, contamination and stalking and jurisdiction is often a question posed in the early stages. No, I think you're right. Lipohar considered a common law offence. So, the doctrine of precedent provides that the principle there will only bind subordinate courts considering common law offences. So, the principle will be only persuasive for statutory offences. But, it's pretty persuasive sort of obiter, coming from the High Court. And it also has the attraction of being logical and sensible. I'd be surprised if courts today wouldn't find the reasoning in Lipohar extremely helpful if they're confronted with these sorts of jurisdictional questions. But isn't murder a common law offence in Vic? Why the difference between Ward and Lipohar? The common law offence of murder has been altered by statute in different ways in each jurisdiction. One difference for Ward was that he could have got the defence of diminished responsibility (and now provocation) in NSW, but not Victoria. Uncle Bob, murder is indeed a common law offence in Victoria. The difference in outcomes between Ward and Lipohar is about 20 years of jurisprudence. And, different judicial officers on the Bench. In that sense, this issue is a nice illustration of one of the strengths proclaimed by the common-law system: its ability to change (albeit incrementally) and adapt over time. I don't think we can expect the issue to come before the High Court soon. Homicides are rare enough, but ones like that in Ward are rare indeed. And of those, there has to be something special about it before the High Court will give permission to hear such an appeal: Liberato v The Queen (1985) 159 CLR 507. For statutory offences, there was a recent Queensland decision of Barkworth v Sidhu  1 Qd R 419where a NSW blueberry packer was prosecuted for packing underweight measures of blueberries. The blueberries were packed in New South Wales, but the discovery of short measure was made at a market in Queensland.